Spot on with The Man With The Golden Gun not being the sum of its parts. Moore gives an excellent performance. Christopher Lee is charmingly menacing as Scaramanga. The plot was topical for the time (and sadly, today, it is topical again). The locations exotic – islands were even renamed for the movie. But there is just something wrong with Gun. Something that alway makes me pass over it when I look at my Bond DVDs … Caroline Munro in The Spy Who Loved Me maybe? The lackluster humor is the main hate I have for this movie. And a whistle on the best car stunt of the 1970s? Dub it out Eon. And, mostly, when making a James Bond movie, the production should MAKE A BOND MOVIE. Make it – FAR OUT … WAY UP … LARGER THAN LIFE. Gun has all the cinema qualities of a CBS Movie of The Week about a cab driver and his drunk wife in Flatbush (but filmed in Burbank). I keep thinking Ed Asner should wander by and share a Shakey’s Pizza coupon with JW’s wife. The book was outstanding and could make a good Craig vehicle today. Gun the movie … well, Maud Adams is gorgeous and there’s that ship in Hong Kong Harbor. Rather than “the plane, the plane” Tattoo, I mean Nic Nac, should have yelled, “the Matador, the Matador.” Come to think of it, AMC became part of Chrysler, for which Ricardo Montelbon was the 70’s spokesman, and Herve went on from his flying Matador to star with Ricardo in Fantasy Island. Coincidence or too much coffee this morning? You decide. Can’t understand why TMWTGG gets so much stick these days? Surely, after 40 years of discussion of it’s pros and cons, it has earned some level of affection. I first saw this as a 14 year old – the target market for the movie (with the mums and dads in tow, of course). At the time, I considered it to be more sombre and Bondian than LALD – although my opinion here has changed over the years. John Barry’s score is underrated. There are some great atmospheric tracks in the album. Just a shame it’s never been expanded. congratulations to ‘the man with the golden gun’ on it’s 40th anniversary. as I had said before. in other comment’s I was only 15 years old when this movie came out. so forgive me if I said I was a great roger moore fan. again the producers try to keep pace with what was trendy and popular in the cinema’s during the middle 70s era. and would you believe it. yes martial art films. the late bruce lee was riding-high on his smash hit (1973) ‘enter the dragon’ so the bond producers follow suit with a little kun-fu in this movie. I actually prefer TMWTGG to Live and Let Die. Maybe it’s because I’m younger and wasn’t around when Roger began his 007 tenure, but I think TMWTGG established that the Moore era was going to go for humor and camp and that fans of the franchise would need to suspend disbelief and just be entertained and have more of a sense of humor. Moore would go on to do better 007 films but TMWTGG isn’t as bad as people say. You just have to appreciate the campiness and let yourself be entertained. Do not agree at all . First ’cause it was the third Bond movie I saw on its first run in cinemas . Second because it has the greatest weapon gadget of the whole series ( and it was a tough act to get it right – see foreword of my 3rd Bond book by Peter Lamont himself ) , third because it has one of the greatest actor portraying the main villain and fourth , because it features of John Barry’s most atmospheric music . 1. Go the Facebook group Facebook alt.fan.james-bond. 2. 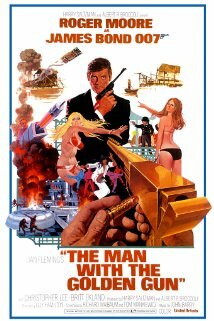 Write a post in that group that you like The Man With the Golden Gun. 3. Read various posts criticizing you for even suggesting that you liked the movie. People you thought you knew will go nuts that you ever thought the movie was decent.